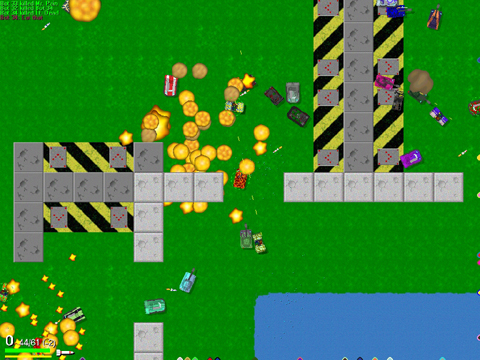 RecWar is a 2D top-down vehicle combat game for 1-2 players (or 1-4 over a LAN) in the spirit of the Twisted Metal series (though from a different viewpoint). In the game, you offered a selection of 3 different vehicles: the Tank, the Hummer, and the Hovercraft, as well as 3 modes of play. The game offers a certain amount of customization when it comes to vehicles, allowing you to pick 2 different colors and one of several different design with which the colors can be used. 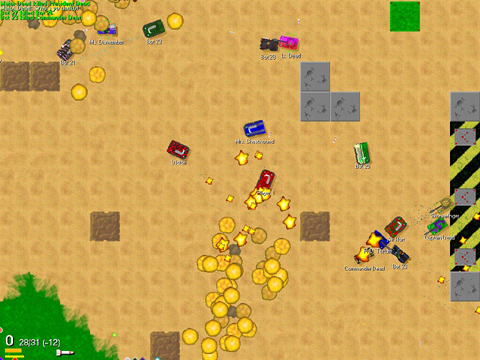 Other dynamic variables include the amount of armor vehicles have, as well as the colors, names and vehicles that the computer bots utilize. The first mode of combat is "Deathmatch". This is a every man for himself battle to the death. This mode is arguably better with around 10-15 players (bots) as anymore make it so frenzied that sometimes you'll die as soon as you re-spawn. The second type of game is called "Team War". this pits you and up to 32 other bots against an opposing team of equal size. In this mode, the more participants, the better. Fast paced and intense, this mode is best played with health set to 100%. The Final mode of play is called "Capture the Cow". This is the RecWar equivalent of Capture the Flag, but with a cow! In this mode you are pitted against the other team (s) in the classic schoolyard game of Capture the Flag (Cow). This mode is best played with the health set at 200%, as it will be incredibly difficult to ever make it through the other teams base and to their cow with any less of a setting. The graphics are a perfect fit for the game and are of very high quality. Explosion animations are perfect and movement is smooth. This game is just as good as any of its commercial counterparts, and the sound is of equivalent quality. The AI is great, making this game very fun, with unlimited hours of gameplay.